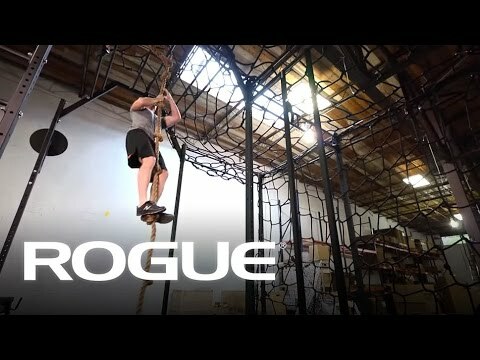 Short Climbing Rope - 6'x1.5"
Climbing Rope - 15' x 1.5"
Climbing Rope - 20' x 1.5"
Climbing Rope - 25' x 1.5"
Climbing Rope - 30' x 1.5"
From gym classes to military training to CrossFit, rope climbing exercises have long been a measure of an athlete’s upper body strength and endurance. But if you want to gauge the strength of a climbing rope itself, you need to start with the quality of the materials it’s made from. Rogue’s American-made manila climbing ropes offer the same reliable grip and durability that’s made the classic manila rope a staple of military bases and shipyards for decades. Available in five different lengths, these gym climbing ropes are designed for indoor/outdoor use with no mounting bracket required. Climbing ropes must be anchored to a smooth, round surface. The improper use of rope MAY BE DANGEROUS. Please read the Product Safety Information. It is the user’s responsibility to use rope in a safe manner!!!! A rope's potential load capacity can vary greatly depending on its overall condition, how it's currently being used, and its exposure to the elements and other factors known to affect rope behavior. Because of this, and the possible risks to life and property involved, it is not realistic to make specific recommendations as to the exact loads any given rope can handle. It is the user's responsibility to completely understand the safe use and operation of the rope being put into service for any specific or general task. The user needs to be aware of all environmental, load and any other variable factors that affect the safe use of rope. Failure to do so can cause severe personal injury and/or death as well as property and/or other environmental damage. The user of this rope assumes all such risks. In addition, any safety training or skill training required for the safe use of rope in any capacity is the sole responsibility of the user of any rope. Climbing ropes must be anchored to a smooth, round surface. Failure to do so may result in a frayed/torn rope that can be extremely dangerous to the user. If you are anchoring the rope to a non-round surface, we recommend the use of a sheath or some other form of rope protector. All rope has a rating referred to as a “tensile strength” or “average break strength” This number is the amount of weight that the rope should be able to hold in ideal conditions. This would be new rope, with no knots or plices, at room temperature. These break strength numbers are based on actual destructive break testing by the manufacturer or a certified third party testing facility over many cycles, and the average break strength is recorded and applied to the product. Rope wear, knots, extreme hot or cold temperatures, chemicals, how the load is applied and many other factors can result in a break strength lower than the stated tensile strength. Just because a rope has a stated or advertised break strength doesn’t mean it will safely hold something that weighs that amount!!! Refer to the safe WORKING LOAD of each specific rope for more information. As a broad generalization, most working loads are anywhere from 1/10 to 1/4 of the average break strength of the rope. Any rope used in life support or personal fall protection applications must use the 1/10 ratio. When in doubt, use a working load factor that affords a greater margin of safety, or move up to a larger diameter rope. Wherever possible, use splices constructed to safe specifications. A proper splice on rope can maintain 80 to 100% of the new rope average break strength. Trained personnel should perform all splicing. If knots are used on a rope be aware that they can reduce the rope strength by up to 50%. If knots are required, be sure to select the proper knot for the job. All natural fiber ropes must be stored in a clean dry place to maximize their safe working life. Synthetic ropes should also be stored long term in a cool, dry place. 3 strand ropes should be coiled or spooled up and braided products can be flaked or coiled in a bag or box if needed. Ropes popular for exercise climbing (like the manila or nylon 3 strand ropes) often are tied or secured to tree branches or interior steel beams to provide a vertical climbing rope. This attachment point must be inspected prior to each climb in order to ensure a safe and intact attachment point. Any knots or splices in this area can be subject to wear or environmental deterioration, so be sure to inspect these areas for any hazardous conditions that could create an unsafe attachment point. Climbing Ropes is rated 4.4 out of 5 by 19. Rated 5 out of 5 by Wes30 from Great Addition 15' Climbing rope was a great addition to my back yard rig. Highly recommend Rogue for their service and products! Rated 4 out of 5 by rocknsnow from rope scent It's a good rope however it has a strong nasty scent when you take it out of the carton. Rated 5 out of 5 by rlwrestling from Quality The 30' x 1.5" climbing rope we purchased from RougeFitness certainly meets the high-quality standards athletes have come to expect from Rouge. We wouldn't trade it for any other brand! Rated 5 out of 5 by bscott from Great Rope! 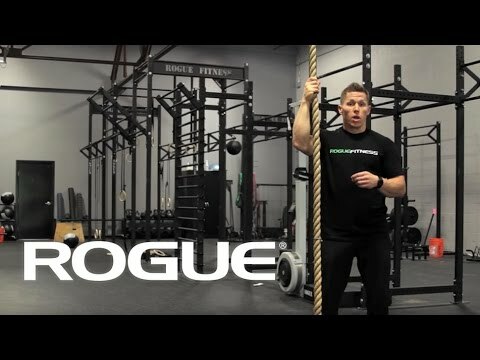 Great rope for climbing workouts. The loop makes it very easy to put the rope up anywhere. I haven't experienced any major shedding like some of the other reviews but I'm strictly using in my garage gym. Thanks Rogue for another excellent product! Rated 5 out of 5 by MattJBotts from Perfect! I use this about 2 times a week and I never get splinters from it. It’s a great length if you don’t have a high ceiling and just need something to climb. Rated 3 out of 5 by Jayburrell from Disappointed I was disappointed that the braided loop ends were not secured with either shrink tape. It came with the fraud ends hanging loose. Now I have to go out and purchase something to secure them.